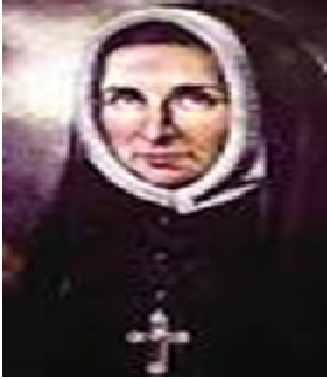 Rose Philippine Duchesne the frontier and fervent missionary of North America was a saint with a mission to do God’s will. As a young religious I was in charge of the Duchesne Club at Sophia College, Mumbai. Every year, when asked to speak or write about this great saint of ours, it has been the usual life history of this very human and seemingly, Saint of Failure whose entire life was dotted with failures and difficulties. We celebrated her silver Jubilee of canonization last year on 3rd July. This year I decided to speak to her for her feast on 18th November 2014. This is the result. Stephanie a teenager from an ‘A’ grade college in megapolis Mumbai has just used a home pregnancy test, and found that she is pregnant. Her boyfriend suggests an abortion. Shocked and disturbed she has not slept for 48 hours. Her best friend from Dadar comes to tell her that her neighbour, a 13 year-old from a reputed school in the vicinity has committed suicide. The marvel is not that we are fallible and foolish human beings but that we have the wit, the audacity, the courage and the grit to see it and go on inspite of it all. Life is embroiled by error and prejudice like a fertile field covered with wild weeds, bramble, stone, rubble and garbage. The miracle is not that we dash our toes against the thorns and the rubble, but that we have enough common sense, wit, wisdom and gumption to clear them away, even if we can clear, only our little cabbage patch that is ourselves. Having done this, we will have cleared it, not only for ourselves, but for posterity! When I joined the Society of the Sacred Heart of Jesus in 1981 as a Novice, I warmed up more to Blessed Philippine then, than to the Foundress St Madeleine Sophie Barat. Today when I look at Philippine she is for me a Prophetic Witness, with determination and soul power and this she did with fiery zeal, graced stamina and ‘Ekagrata’ or one-pointedness, clinging on to the cross like a treasure in her life. Born on August 29, 1769 into a wealthy and politically connected family in Grenoble, France, Philippine decided to join religious life much against her father’s will, who terminated her attendance at the St. Marie d’en Haute when he heard of her plans. Duchesne means of oak and like a strong oak undaunted, she climbed the hills on the outskirts of Grenoble a little later, and joined the Visitation Convent. As God would have it, religious life was disbanded due to the French Revolution and she had to return home. She bore it all patiently and with fortitude letting God’s wisdom take its own pace, keeping her nerve at all times. Undeterred, with rare courage, unlimited faith and magnanimous love that never ends, after the war, Philippine valiantly attempted to bring back the nuns to St. Marie but failed miserably. Determined to do God’s will and with zeal for mission she joined the new congregation of religious women established by Madeleine Sophie Barat in 1800. Having worked for 13 years in various activities in Sacred Heart convents in France, Philippine never abandoned her childhood dream of going to work in the missions of America among the Red Indians. Leaving securities behind, to reach beyond what one can grasp in 1818, at the age of 49 together with four religious companions, she embarked on this arduous 70-day voyage across the Atlantic to New Orleans, where they disembarked and rested briefly with the Ursulines, before resuming their travels in a paddlewheel steamer up the Mississippi to St Louis. The first free school with three girl boarders and twenty-one day scholars began in a log cabin in St Charles. The next year the school shifted to Florissant, where Philippine also started her novitiate for the Society. In 1828 the Jesuits called her back to St Charles. Finally in 1835 the first brick building was erected. Soon Philippine established other schools in Louisiana and Missouri. Tested in the crucible of fire, constantly expanding the borders and boundaries of her heart – boundaries of social class, language, culture and customs, at the age of 72 she held back nothing for herself, begged and was finally allowed to travel to Kansas to teach the Red Indians. With no flair for languages, she found the Pottawatomi language even harder than English and never learnt it. Nothing is impossible with God for the one who trusts was her conviction. No wonder the Indians called her The Woman Who Prays Always. Philippine with a global heart and an inviting model for our 21st century world, returned to St Charles where ten years later she died on November 18, 1852. 43 years later in 1895 her cause for canonization began. She was declared Venerable in 1909, Blessed in 1940 and canonized in 1998 by Pope John Paul II. The woman who was the so called failure pioneered Sacred Heart Education in the New World i.e. America. If today, I work with love, passion and zeal in the missions of Patna in North Bihar, India, it is only due to St Philippine who has been my role model all through my life as a religious. Happy Feast of St Philippine Duchesne on November 18th, 2014. Jeyapaul was arrested March 16, 2012 in Erode district in Tamil Nadu and has since been lodged in New Delhi’s Tihar Central Jail. New Delhi:The Delhi High Court Friday dismissed a plea of Catholic priest Joseph Palanivel Jeyapaul, accused of molesting a child in the US, against his extradition. Jeyapaul, 59, had challenged the order of a trial court here recommending that he be extradited to the US to stand trial. Justice Pratibha Rani dismissed his plea, saying she has not found any fault in the decision of the trial court. The trial court said a prima facie case was made out for his extradition. If extradited, Jeyapaul will stand trial on charge of first degree criminal sexual conduct in Minnesota. The charge carries a maximum sentence of 30 years in jail. The priest, a fugitive from US law, has been charged with molesting a 14-year-old girl in the US in 2004 when he was at a pastoral ministry at Roseau county. The priest allegedly met the girl at a youth conference in 2004 and abused her for nearly a year till he left for India Aug 28, 2005. He then maintained a low profile. In December 2006, the teenage victim filed a criminal complaint accusing him of sexual assault. In 2010, Archbishop of Madras Mylapore A.M. Chinnappa asked Jeyapaul to return to the US to face the charges. On Feb 1, 2011, the US embassy in New Delhi sent a diplomatic note to the external affairs ministry requesting extradition of Jeyapaul claiming he was wanted to stand trial. The ministry approached the trial court to determine whether a prima facie case existed for Jeyapaul’s extradition.